As we develop the video controls, allowing developers the flexibility to decide which display time and/or labels suite their content will be important. Some video players today allow for toggling between relative and absolute time by clicking the timestamp: certainly an easy way to allow for both, if not very discoverable. 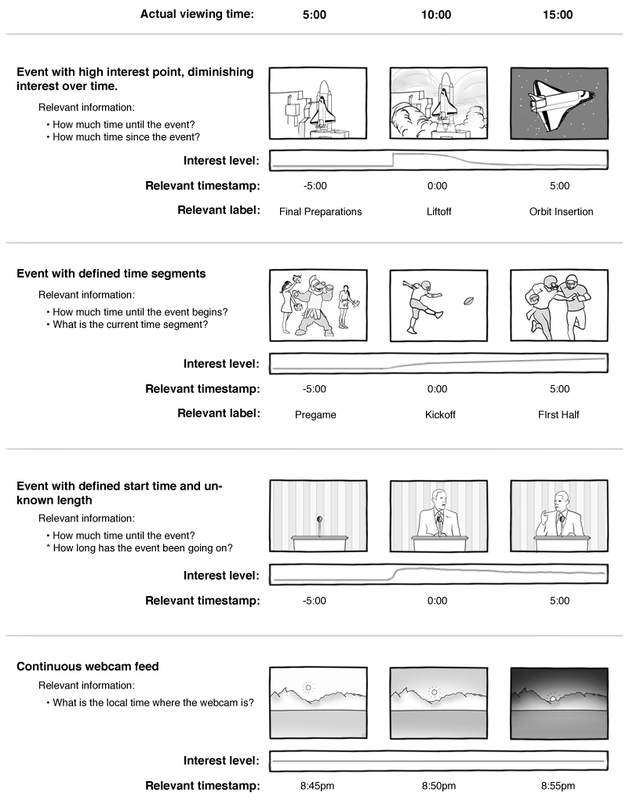 We may find there’s other ways to improve usability for high traffic events, such as sports games or shuttle launches, by storing buffered video remotely rather than having users buffer it individually. Gerv points out that dynamically degrading video over time can allow for more content to be buffered, and Faaborg notes that there are instances that the user may want to save as much video as possible: two excellent points, which stress that making the video tag open and adaptable for the many kinds of content it can display is a primary objective. I miss one usecase: When i watch a program with a known end time, i like to see the remaining time more then the time i’ve been watching. Especialy when watching a TV show, it’s nice to know how much longer i have to stay focussed. Also gives a good estimation if i should stick around 1 more min till the end, or pause, and do some important stuff first that can’t wait 30 minutes. Yeah, it really does sound like the ideal thing is to provide various modes, or just give the webmaster control over the display and provide a reasonable default. Almost everything described here has been and can be done within Quicktime… Other more important areas of interest would be security cameras around the house, upon motion detection, the video is tagged and upon returning home, you can see the time of day and it allows for easy reviewing. A LOT of people don’t understand that QT is this powerful but I would suggest taking a look at LiveStage Pro over at Totally Hip Software ( http://www.totallyhip.com/ ) We generated a live tagging software to allow for live multiple camera viewing that allowed for the user to select the camera he or she wanted to watch. Additionally, it allow for the content provider to tag “highlights” during the live event, so a user watching Camera A could be made aware of a better angle or of something going on that a trained professional would see or spot. And yes, event tagging even took a single frame, as a representation, of what was tagged.